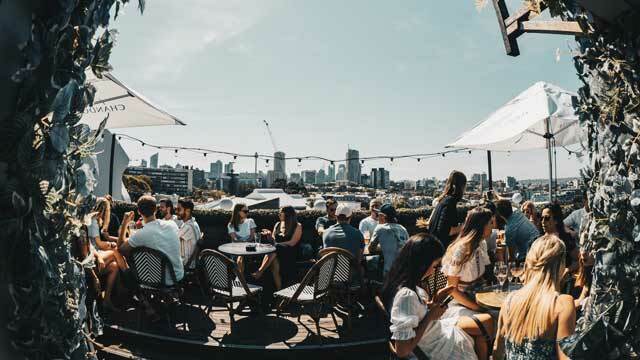 The ultimate guide to the 24 best rooftop bars in Sydney in 2019. So, which is the best rooftop bar in Sydney? Here's a complete list with all info you need about each rooftop. Opening hours, dress code, pictures, location and much more. This city has it all. Beautiful views, ocean, harbor, skyscrapers and fantastic restaurants / bars. In other words – Sydney is an awesome rooftop city. Most of the roof terraces here are located at fancy hotels or cool bars. 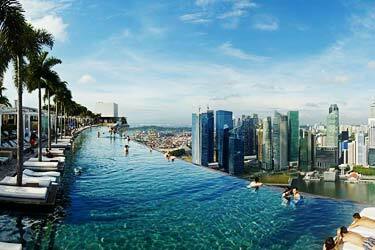 There’s also a wide range of rooftop swimming pools available. 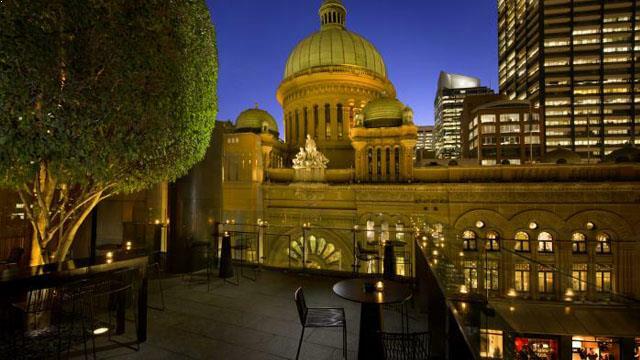 Just scroll down and find the Sydney rooftop bar best suited for you. Or use the Sydney rooftop map in the bottom right corner. A real Sydney classic, built in 1921 and last renovated in 2012 it comes in an old colonial English tradition with a modern touch. The three level establishment has the real gem up top, the rooftop bar where you get an unbeatable panoramic view of Sydney Harbour, the Sydney skyline and the Opera House. 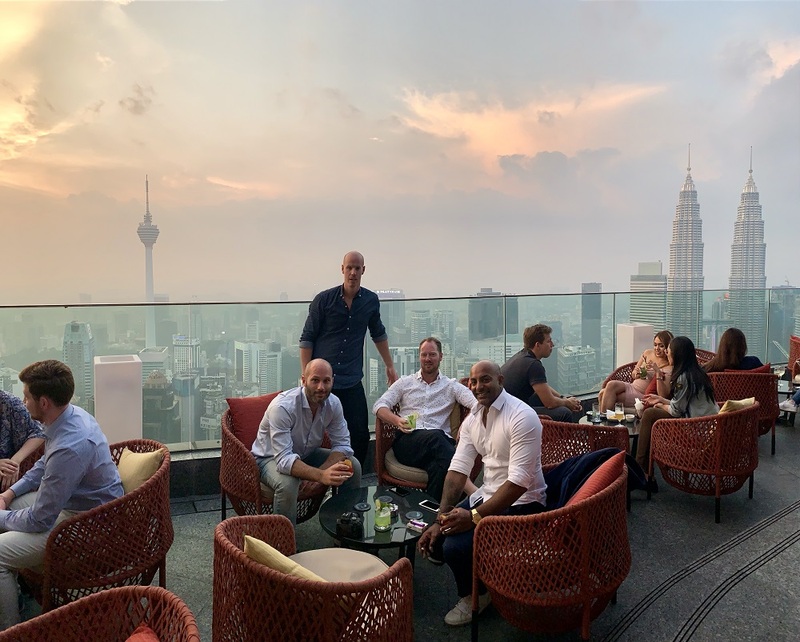 Modern and fun pub-style rooftop bar, perfect for relaxing drinks and bites in a casual but vibrant atmosphere. Enjoy a mighty impressive beer list, well made cocktails in both glasses and jugs along with bar bites and more filling gastro pub eats. 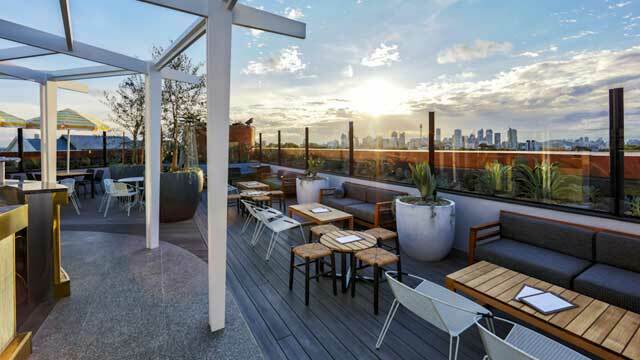 On top of Potts Point Hotel, close to Kings Cross Station, you find the casual, fun and trendy Sweethearts Rooftop. Urban chic and vibrant in feel and decor, with a mix of picninc tables, bar tables, string lights and plants, this is a great Sydney rooftop bar for nice tunes and good times. The rooftop bar serves a fresh mix of shares, burgers and pizza along with tasty Sweethearts signature cocktails, Pimm's on tap and a few wines. Come for vibrant drinks any night, Sunday Party or rooftop cinema. A stylish, sophisticated and chic cocktail bar, located at the Sydney Hilton's rooftop terrace with spectacular views of downtown Sydney and the Queen Victoria Building directly opposite. Although fine in decor, what really makes Zeta rooftop bar stand out is the fantastic selection of cocktails. Progressive and internationally acclaimed for their creations, the cocktails are very creative, quite pricy, both worth every penny. Usually a perfect spot for sophisticated and relaxing drinks, weekend nights means live music and Saturday night full on night club. 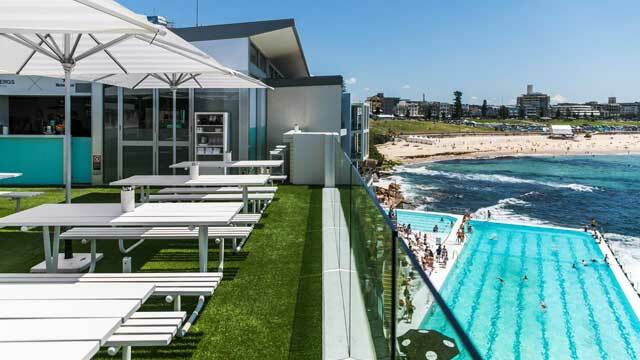 Mix up Bondi Beach with some calmer rooftop swimming. 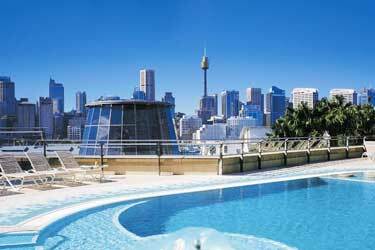 Check out our list of the best rooftop pools in Sydney, amazing pools with dazzling city views. New and stylish rooftop bar, perched on top of the Shelbourne Hotel, right by the Pyrmont Footbridge. 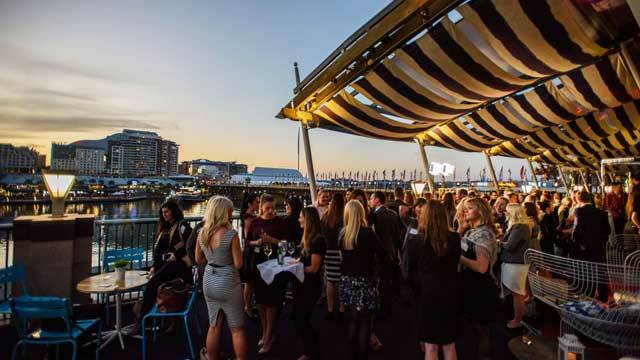 Up here you can enjoy alfresco sunset drinks, relaxed rooftop dining, music and great views over Darling Harbour. Bright and warm in decoration, taking inspiration from the Hamptons, the terrace has a nice garden-feel and also comes with a retractable roof, open for sunny summer drinks and closed if the weather turns to the worse. Sophisticated, relaxed and friendly in vibe, the rooftop bar offers both crafted signature cocktails and a food menu that's all about sharing. The Rooftop is currently closed while work is being done to transfor the space. 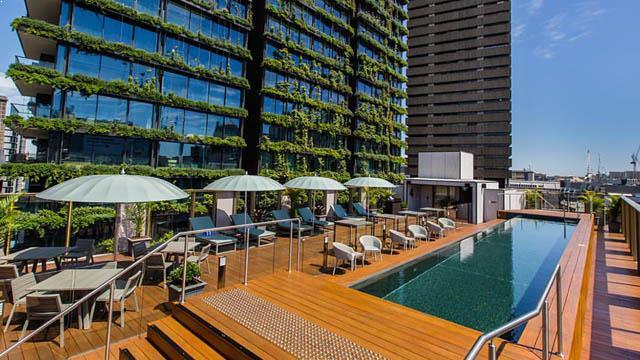 On top of the fantastic five-star The Old Clare Hotel you find a great rooftop terrace, complete with a stunning rooftop pool and beautiful views of Sydney and Chippendale. Great location right by the Central Station, relaxed atmospere, and the only 'problem' is the the roof terrace and Clare Pool Bar is accessible only to guests at the hotel and for private events. Up on the 32nd floor of the luxurious InterContinental Sydney you find the city's probably most exclusive rooftop bar, along with the best view covering all the major attractions. Sweeping vistas over Sydney Harbour Bridge, the Opera House and the Botanic Gardens. Only available for private events, this is the ultimate rooftop bar in Sydney for engagements, birthdays and milestone celebrations taken to the next level. The fabulous Watsons Bay Boutique Hotel comes with a fantastic beach club that includes a second floor terrace, offering a fantastic view of Sydney's skyline and all the boats in the bay outside. 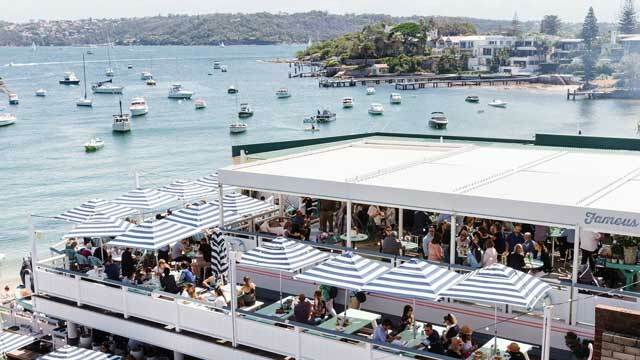 Located on one of Sydney’s most iconic harbour beaches, the beach club and rooftop bar is a perfect place for relaxing seaside cocktails. Chic and classic maritme in decor, the rooftop bar is open from early morning to late at night. Come for relaxing afternoon cocktails with a fantastic sunset or vibrant weekend beachside vibes with live DJs and a large crowd. A large and happening place, located right off Coogee Beach. Not only does it have a rooftop with four different bars and a huge wrap-around balcony, but also a great downstairs restaurant. While the downstairs is a very family friendly venue, the upstairs rooftop is an adults only zone. 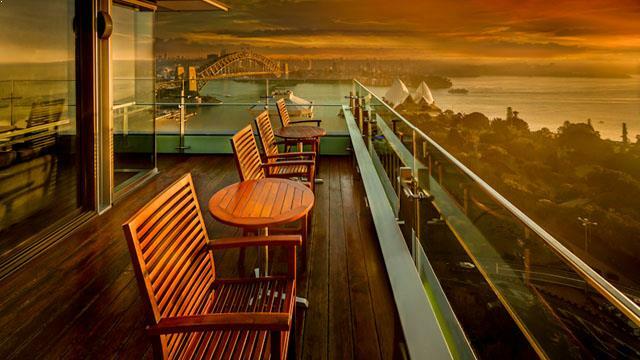 From the spectacular terrace you get a magical view of the Australian coastline and the nearby surroundings. Modern, lush and bright in decor, here you can enjoy great Eastern Mediterranean food, a large selection of beer and wines along with excotic and fresh cocktails. A lovely rooftop bar and restaurant in Bondi, Sydney, with an amazing view over the Pacific Ocean. The name actually only tells 2/3 of the story, as apart from dining room and bar, Icebergs also comes with a very nice summer rooftop terrace. Thhe indoor dining room and bar is a very stylish, open year round and serves Italian fine dining, handcrafted drinks and music, while the outdoor terrace is more casual in decor and comes with its own menu including a selection of pasta and burgers and a few beers, cocktails and wines. A terrace bar in Sydney only situated on the 4th floor, but still at an altiutude of 83 meters above sea level, resulting in spectacular views of the Sydney skyline. Located in Paddington, The Light Brigade comes with 4 different settings over 4 floors. With sports bar/pub, casual bistro and Art Deco cocktail bar below, the rooftop bar is a relaxed venue, perfect for long hours in the sun. Decorated with stylish lounge furniture, here you can enjoy signature wood-fire pizzas along with a pretty basic list of classic cocktails, beers and some wines. The perfect way to start your day! 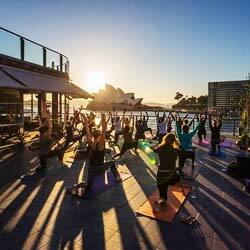 Check out our list of the best rooftops for some yoga in Sydney. Amazing places to relax with some yoga to the sweeping city views that Sydney has to offer. A luxurious rooftop bar that brings a slice of Ibiza rigth to Darling Harbor and the heart of the city. Both restaurant and rooftop terrace, up here you get a beautiful view of the Sydney skyline and the waters of Darling Harbor. With modern and comfy lounge furniture, blue and white shades and a cool outdoor bar, the beach club vibe is obvious. From the rooftop bar you can order Mediterranean influenced tapas along with crafted cocktails and a large selection of wines and bubbles. Also offers one of Sydney's premiere 'Sunset Sessions' on Sundays. A classic local pub with a twist that you should visit mainly for the Bristol Rooftop up top. 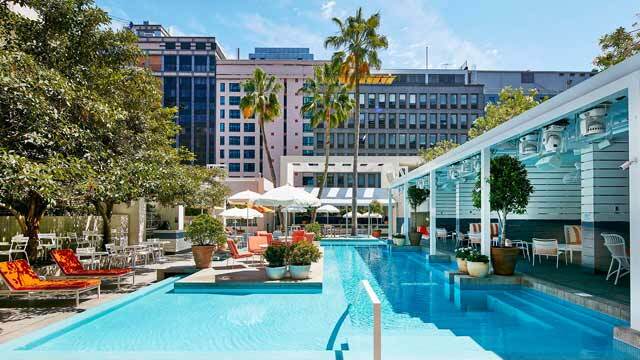 Located in Sydney CBD, close to Darling Harbour, the spacious indoor and outdoor terrace offers cool views of the central parts of the city and also even a glimpse of the water. Quite a large venue with both public bar and dining spaces indoors, showing sports and serving classic pub food. Up on the rooftop you can also enojy a burger or similar pub-grub along with a large drink menu and live DJs during the weekends. 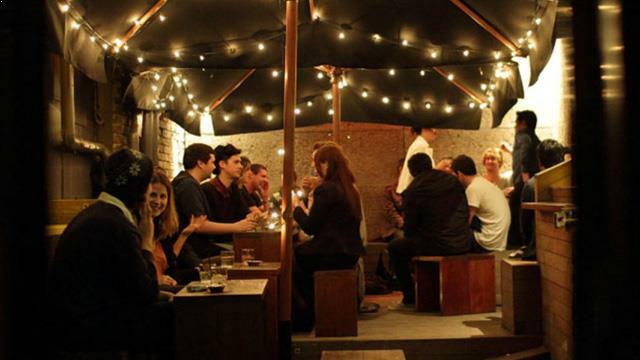 This is a small New York loft style bar with rooftop deck, located on Oxford Street in Darlinghurst. 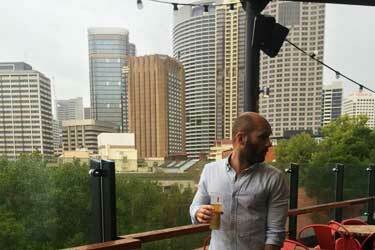 It is quite hard to find, but definetly a rooftop bar in Sydney worth the search. With room for about a 100 people, Ching-a-Lings comes with an urban and beatiful setting, both at the small inside bar and out on the rooftop deck. No grand views to brag about, but instead a vibrant, fun and friendly atmosphere. Enjoy live underground DJs every night, wine from a barrel, cold beer and very well crafted cocktails. LA glamour meets the Italian Riviera right in the heart of central Sydney. That is the short description of the luxurious Ivy Pool Club, one of few rooftop pool bars that the city has to offer, and a diverse place depending on when you visit. The decor takes inspiration from Palm Springs in the '60s and from the Ivy rooftop bar you can enjoy delicious Italian pizza along with creative and well crafted cocktails. 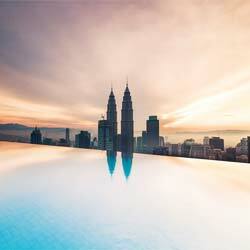 Visit during the day to enjoy the magnificent rooftop pool, early night for sophisitcated vibes and cocktails, or weekend for full on party vibes. At street level Hotel Sweeney's looks like (and very much is) a classic Aussie sports pub. But on top of the building you find a very nice surprise and somewhat of a hidden gem: Sweeney's Rooftop Bar. With location right in the heart of Sydney, the rooftop terrace offers magical views over the central parts of town. Quite classic in decor, this is a rooftop craft beer bar, with a rotating lineup on eight different taps along with different tap takeovers every now and then. The Metropolitan Hotel brand themselves as 'Sydney's newest old pub'. And being established in 1834, and last renovated in 2015, this might very well be true. Here you find a Public Bar and Gaming Room on Level 1, restaurant on Level 2 and up top, the Metropolitan rooftop bar. 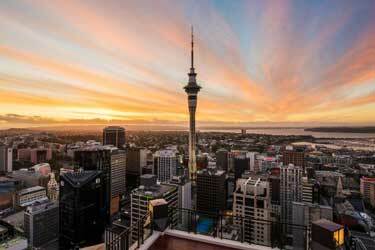 Located right in the CBD, the terrace comes with a cool view among the surrounding sky scrapers. 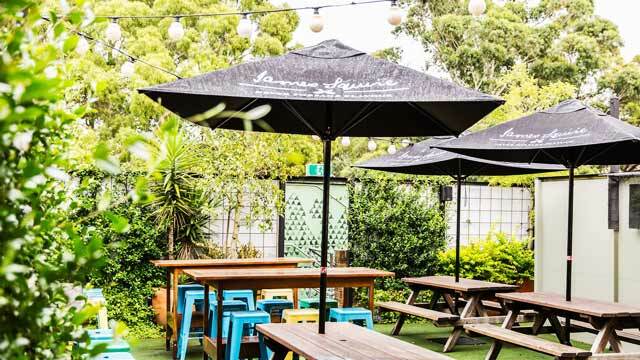 Decorated in classic pub style but with a modern touch, unpretentious and friendly in vibe, the rooftop bar offers good quality pub food along with a classic drink list. 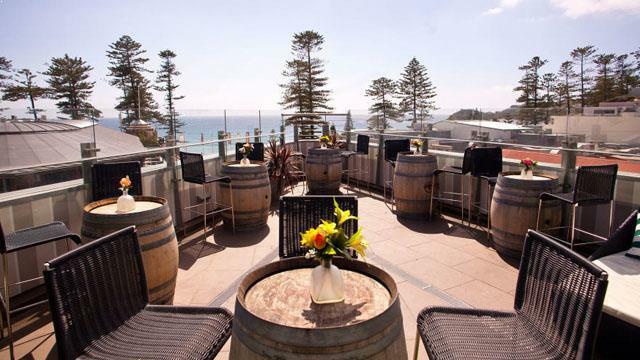 From the rooftop bar at New Brighton Hotel in Manly, you get a lovely view of Manly Corso, Manly Beach and all the way to Shelley Beach. Top spot for saoking up sun while enjoying food and drinks. The large Rooftop Garden Bar comes in a nice beachside vibe and decor, decorated with regular and Balinese day beds, private cabanas, basket chairs and bar stools. Here you can enjoy well made cocktails, a large selection of craft beer & cider and some tasty finger food. Below the rooftop you also find 3 other bars. Three floors up you'll find this rustic beauty called Websters Rooftop Bar. 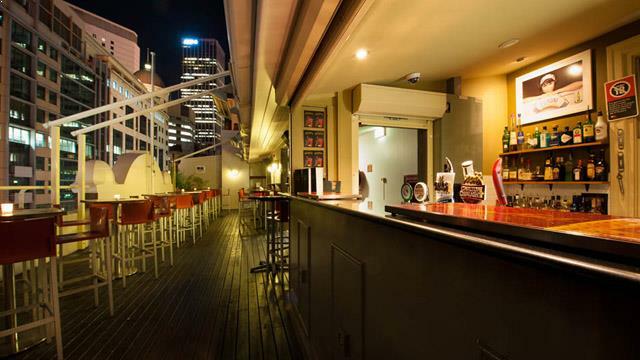 Located in Newton, Websters Bar is, like many other in Sydney, a several floor establishment. Here you find the ground floor King St Bar & Restaurant, the second floor Bourbon Bar & Grill and up top the rooftop bar. Open from morning to late at night, the rooftop bar serves a great selection of well made classic pub dishes along with crafted beers and a nice selection of wines. The most impressive menu is however the whisky-list, with over 600 different blends. 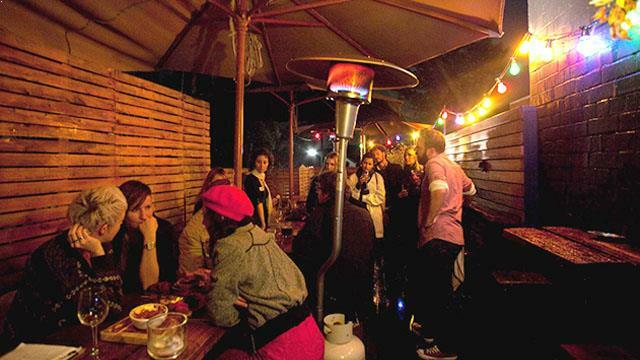 Corridor is a great neighbourhood-feel bar in Newton, complete with a small and cosy rooftop deck. And while this Sydney rooftop bar does not offer any grand views, if you can settle for a great atmosphere, friendly service and tasty drinks, you will still be just fine. Trashy-chic and urban in decor, Corridor is mostly famous for their fantastic coktails, made to perfection by the very friendly bar staff. Try to catch a spot at one of the wooden benches at the small rooftop to enjoy them. A multi-level and multi-space establishment located in Paddington. With sports bar and pub on the ground floor and gastro pub on second floor, the real gem is the 3rd and 4th floor cocktail bar Elephant Bar & Rooftop. Small but very stylish rooftop that offers fantastic views over the eastern suburbs of Sydney and all the way to the skyline. The decor feels somewhat like an English garden and this is a great place for relaxing and sunny drinks with some friends. Enjoy well crafted signature and classic cocktails and table service on weekends. 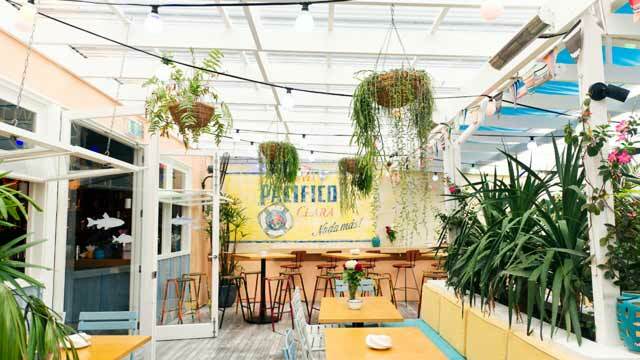 SoCal restaurant and rooftop bar offers a slice of Southern California in the nothern part of Sydney. 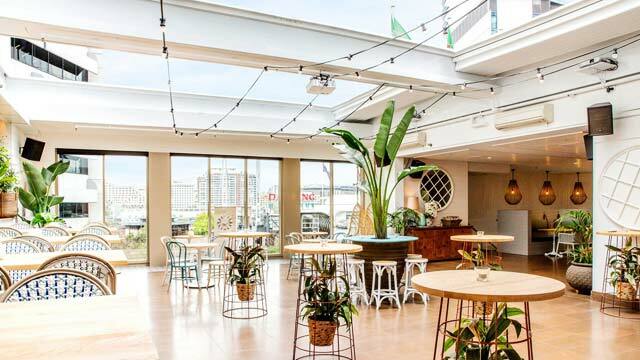 Situated over two floors, with ground floor indoor restaurant and a lovely bright and colorful rooftop terrace, oozing with laid-back California vibes. The only thing missing is ocean views. Enjoy ‘share-style’ street food, filled with Latin American influences along with fantastic and well made cocktails (where Tequila is not an unusual ingridient), beer and wines from Calfornia and Mexico, but also more local selections. Located in the heart of Double Bay, this is the areas premier drinking, dining, pet friendly, sport and late-night party destination. And best of all, it comes with a lush and lovely backyard Beer Garden, that also leads up to a great second floor Rooftop Bar. Surrounded by greenery, the views are not breathtaking, but rather cool watching the action in the garden below. 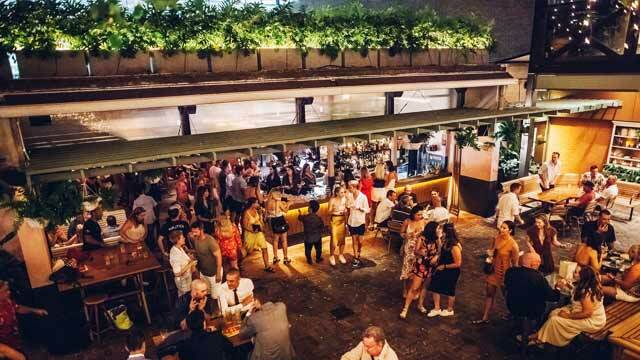 A bit of an exclusive oasis inside The Golden Sheaf, this is a spot to enjoy specially curated cocktails and DJ vibes with a trendy crowd. A classic Aussie pub, but a recent refurbishment has given it a modern touch and appealing to a new and hip crowd. 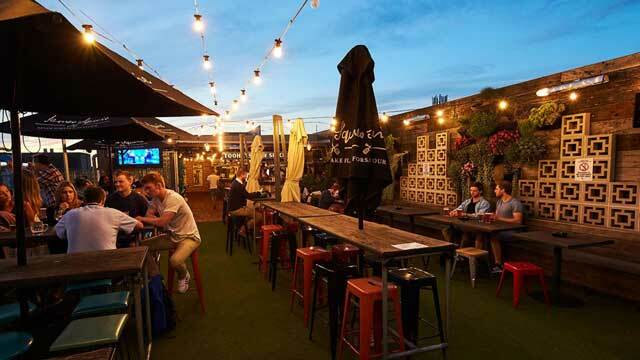 Located in Surry Hills, just south of the Sydney Central Station, it comes with a ground floor pub and restaurant and an upstairs rooftop beer garden. Enjoy fresh pub food, value for money drinks and a fun and relaxed atmosphere. Open from morning to very late, with different daily deals on drinks and food, Wednesday Trivia, video jukebox playing old classic and live DJs on weekends. 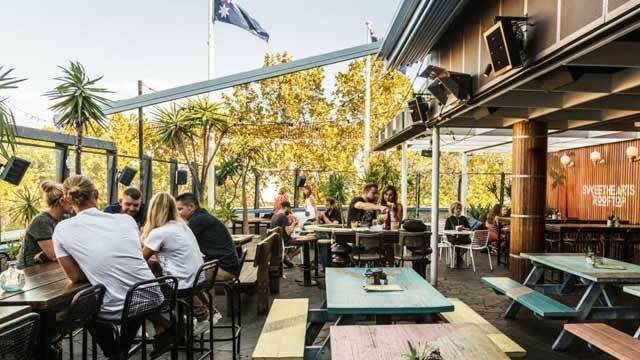 Located in Willoughby, north of central Sydney, the Bridgeview Hotel is a casual, neighborhood-type pub and rooftop bar. The inside public bar shows all types of sports and the upstairs green and very lush rooftop garden is a perfect place for relaxing drinks in the sun. No views to brag about, but instead a friendly and unpretentious amosphere. The food menu is described as 'quality pub grub at great prices' and the drink list offers a selection of classic brews and a few crafted beers, some wines and classic cocktails. Discover the biggest collection of Sydney activities, guided tours and skip-the-line tickets. Anything you want you'll find right here. 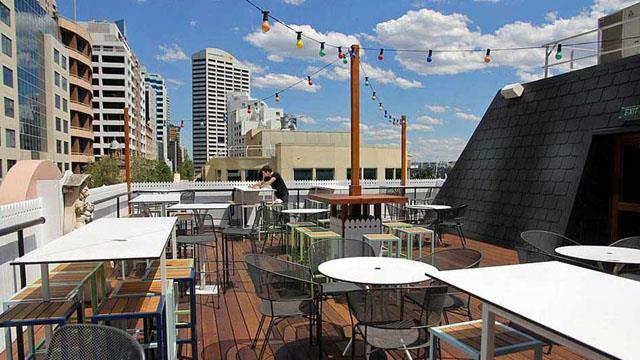 Which are the best rooftops in Sydney? 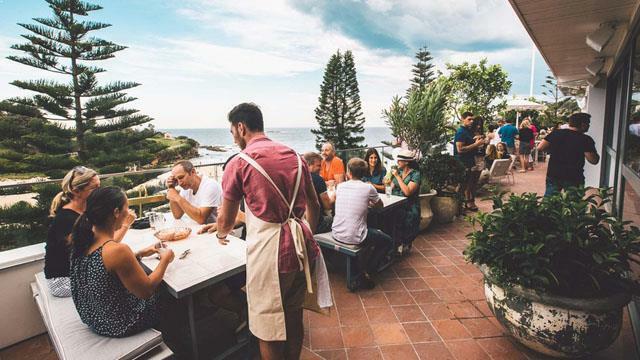 This complete guide will help you find the best rooftop bars in Sydney. 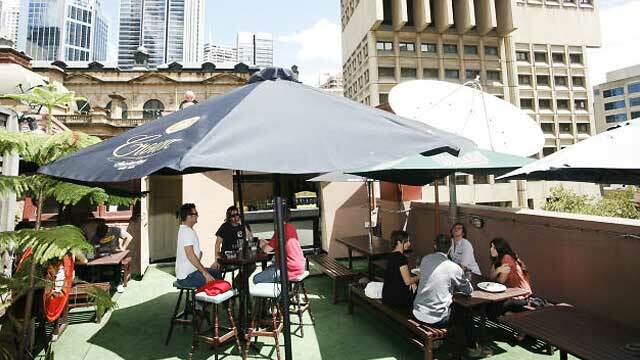 The climate is warm all year round, resulting in a good range of rooftop bars in Sydney. The terraces are often large, luxurious and with a lovely view of the city and its surrounding waters. Most of the Sydney sky bars are located in the city or in adjacent to Sydney's center. But there are also some that are a little more outside the city. For example, there is a good one in Manly and one a little south of Bondi. Sydney has a very wide selection of good roof terraces. Here you can choose between several different roof terraces who have completely different style, interior, visitors and restaurants. The best thing about the typical Sydney rooftops is not the view, but more that there are so many different terraces that there is always something that suits everyone. 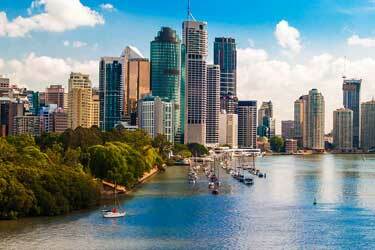 Sydney is Australia's largest city, beautifully located in the country's southeast coast right by the Tasman Sea. The city is situated on hills surrounding Sydney Harbour, which is one of the world's most famous ports. Here you will find both the Opera House and Sydney Harbor Bridge, both of which are world famous. Sydney is often ranked among the world's best cities. Here you’ll find a little of everything. Sandy beaches like Bondi Beach and Manly Beach, city parks and botanical gardens. The city has also been host for various major sports championship. For example, they organized the Olympics here in 2000. Sydney is a real metropolis with plenty of good restaurants from every cuisine. This also applies to the roof terraces. 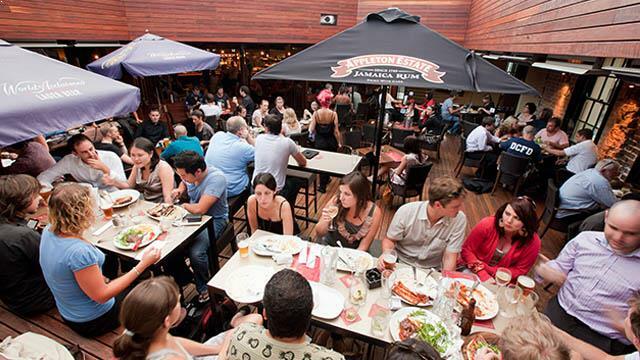 On most of the rooftop bars in Sydney you can eat well - both domestic and foreign food. Mainly the Asian food here is very good. Regarding drinks it’s pretty much the same as on rooftops in other contries. But of course lots of people drinks beer given the British culture and the warm climate. For those who want to party and have fun, there’s plenty of nice rooftop bars to visit in Sydney. 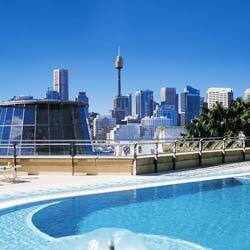 Some roof terraces in Sydney organizes very good parties with good arrangements and partygoers. Although that Sydney is a very big city with a lot of skyscrapers in the city, the city rooftop bars here are often located at a relatively low altitude. It has a lot to do with Sydney city does not allow rooftop bars on the roofs of skyscrapers. Despite this, one can get a magical view of many of the roof terraces in Sydney. The views vary greatly between the different rooftop bars. Some have views of the sea, the other towards the city skyline, a part of the harbor and Opera House. That said – if you want to choose a view, there’s a great deal of different rooftop bars in Sydney to go to. Sydney is as I said a real metropolis. Here you find most in terms of attractions and activities. If you want to visit the beautiful beaches, there are lots of great places. Both central and a bit beyond. Or how about the famous Bondi Beach and Manly Beach. Fabulous white sandy beaches where lots of people gather every day to sunbathe, swim or surf. There are also quite lovely botanical gardens in the city that you can wander around and just watch the beautiful vegetation. If you want to be a little cultural, Sydney have one of the world's most famous opera houses here and a good selection of museums. But the best thing about Sydney is probably the city's small, cozy cafés, bars and restaurants. Here you can stroll around forever and just eat and drink. Sydney Airport is the only airport Connected to Sydney. Although Australia is fairly remote with other countries in the world, many airplanes lands and take off from here every day. 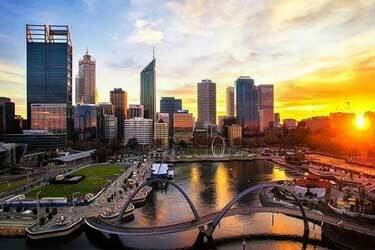 Mainly from the Airline companies Qantas, Jetstar and Virgin Australia. The airport is fairly close to the city, which increases the flexibility of communication here. Hotel's something they have lots of in Sydney. A very wide range with everything you can imagine. 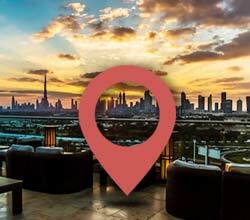 The more luxurious hotels can often boast with fine rooftop bars. 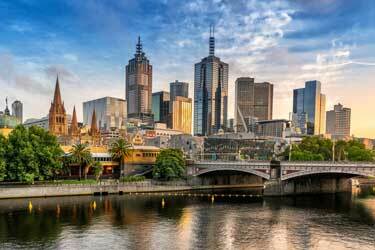 Book your hotel in Sydney through us and take advantage of the best prices in the market.